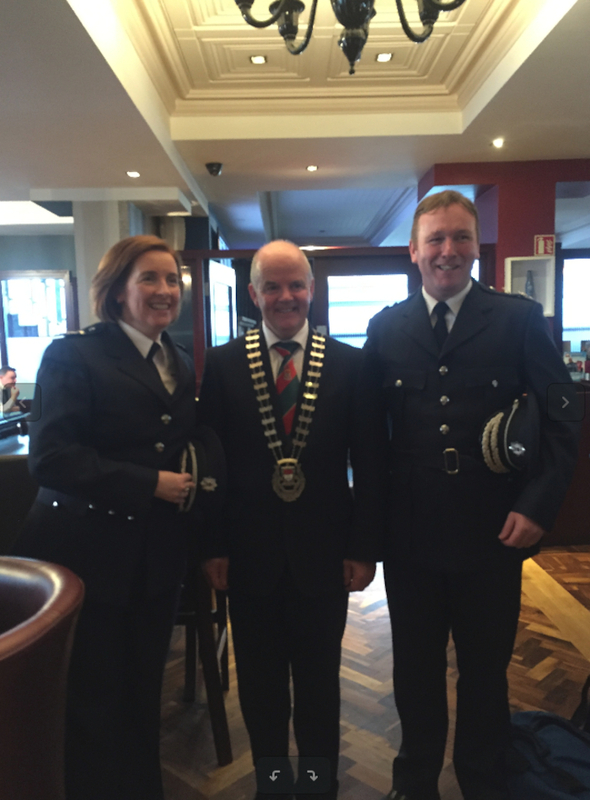 Senior Assistant Chief Fire Officer Aileen O’Connell, Cathaoirleach of Mayo County Council, Cllr Blackie Gavin, and Donal Reilly (Charlestown) at the awards ceremony last week. Thirteen Mayo firefighters with a combined service record of 270 years, were honoured at the National Fire Service Awards in Dublin on Thursday last. Frank O’Malley, Louisburgh, Iain Smyth, Castlebar, and Henry Mellott, Ballinrobe all received 40-years service to the fire brigade awards. John Brady, Claremorris, Eugene McIntyre, Charlestown and Desmond Maughan, Crossmolina, were in receipt of 30-year awards. Thomas Moran, Achill, Michael Moran, Kiltimagh, Senior Assistant Chief Fire Officer Aileen O’Connell, Assistant Fire Officer Donal Reilly, Simon Craig, Charlestown, Christopher Walsh, Charlestown and Bernadette Murray, Achill, all received awards for 20-year service. The award in recognition of 20 years’ service takes the form of a medal bearing the traditional logo representation of the fire service – a helmet and crossed axes. The medal ribbon bears the Irish national colours, with a central column in red to represent the fire service. The 30 years’ and 40 years’ awards are both representations of a flame in emblematic form. All of the awards are accompanied by an corresponding certificate. The awards were set up to give recognition to fire service personnel with over 20, 30 and 40 years’ service. Presenting the awards, Eoghan Murphy TD, Minister for Housing, Planning and Local Government, stated the awards scheme is the Government’s way of honouring local authority fire service personnel for “being there over all the years, for being prepared to respond to calls for help, at all times, and in all weathers”. Congratulating the recipients of awards, Cathaoirleach of Mayo County Council, Blackie Gavin, said the commitment and professionalism of these long-serving firefighters is indicative of the highly experienced personnel employed by Mayo Fire and Rescue Service. Chief Executive of Mayo County Council, Peter Hynes, said Mayo County Fire and Rescue Service has a proud tradition of service to the people of Mayo, adding: "Presently, our fire and rescue staff are among the most highly trained in the country and we are continually pushing to raise staff training levels even further. We remain fully committed to providing a multi-skilled approach, not alone to the areas of firefighting, but also to rescue and fire safety engineering."